Bucking the current economic trend, Solutions Group has invested in excess of £100,000 in creating what it believes to be the UK’s first club-sized room for the demonstration predominantly of professional sound and lighting equipment, distributed to the trade through its specialist operating division Impact Products (Europe) Ltd. As the events of the day went on to show, however, the versatile 100m² auditorium will offer a host of other applications to the Company and its customers. With the room laid out as a retro-style Bistro, the congregated crowd was literally led down the red carpet for the official ribbon cutting by the Mayor of Northampton, councillor Brian Markham. Over musical entertainment, provided by local vocal artist Neal Astbury performing a selection of Rat Pack swing classics, an Italian flavoured lunch was served. 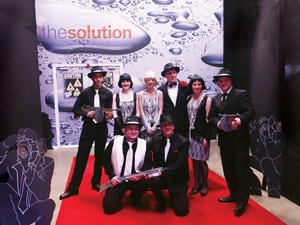 A nod to the significance of the following date meant a few unexpected surprises were in store for the audience as Solutions Group staff, garbed in 1920s Chicago mobster and moll attire, burst in with ingeniously crafted replicas of Thomson machine guns and pump-actions shotguns to recreate the St Valentine’s Day Massacre. “We weren’t expecting that” was heard from the floor as a blood-stained victim was dragged from the stage to make way for a full demonstration of the huge range of sound and lighting equipment flown from a permanent trussing system erected from Litestructures’ AstraLite and LitePro290 series. Apart from the permanent displays of lighting fixtures supplied by Chauvet, for whom Impact is the exclusive distributor in the UK, and extensive range of speaker systems and audio processing equipment – including full Line Array installations – any product from Impact’s massive stock can now be installed by appointment for customers to put through their paces. A multi-faceted business, Solutions Group is also a long-established supplier of products to the aerial and Satellite TV trade and, alongside the huge demonstration capabilities offered to sound and light professionals, satellite and terrestrial TV feeds into the room are also designed to support the launch and demonstration of equipment used in the fields of aerial and Digital TV installation. The Solution’s versatility was further proven when, having already been used a restaurant, presentation room and demo auditorium during the day, it was quickly rearranged to become the venue for a celebratory party. Staff and suppliers pitted their skills against each other on a variety of video games fed into the numerous visual display panels installed around the room and danced the evening away to the sound of local rock band Roadkill, who have now also got their eye on the room as a potential rehearsal studio and setting for the filming of promotional video footage.